My father was a veteran and he was proud of it. I was proud of my father as a vet. My father joined the army in 1941 to fight in World War 2. He was from a Mennonite family and protected from fighting for religious reasons so he didn’t have to join but he choose to. He and my uncle made a choice to support their belief in Canada over their religious beliefs. 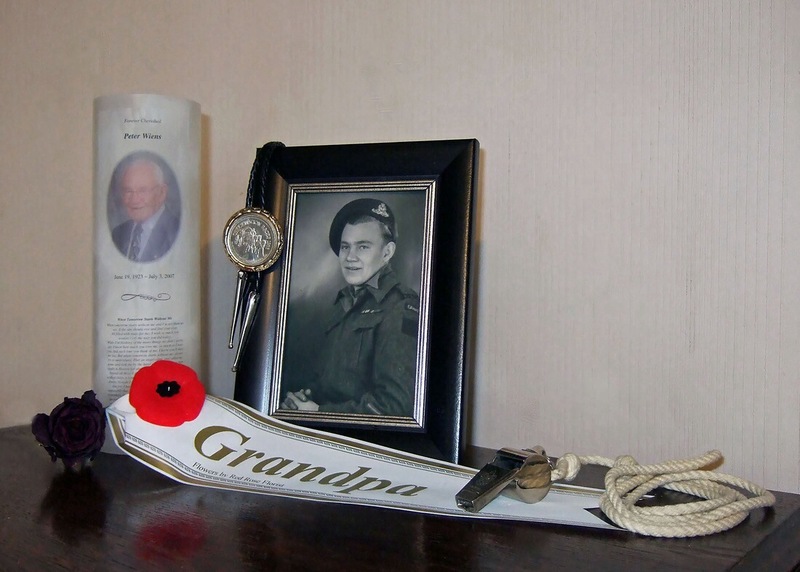 My fathers choose to support the Canada that gave him that same religious protection to stay out of the war. He left the farm, went to Winnipeg and signed up. He didn’t sign up to further his education or obtain trades training but because he was a patriot. He signed up to defend the freedom that he was able to enjoy as a citizen of Canada. My father was a veteran and I am very proud of that. He wasn’t asked to sign a form denying his right to speak out against the government when needed. He signed his recruitment papers, received a welcome aboard message and went off to basic training. He never questioned it because he trusted in our democracy. Not only did he sign up but he vouched for his under age brother who also wanted to join the Forces. My uncle was only 17 at the time but in those days if a family member in the forces “vouched” for you, you were in. After all we were two years into World War 2 and Canada didn’t have a draft system. If you already had a family member in the forces and they sponsored you, as in vouching, you were in. I find that ironic considering how “vouching” today has become a negative thing to the current government in power, the same democracy my father and uncle fought to defend is now being eroded by denying people the right to vote. Not only did my father and uncle join the forces but they went against a life long philosophy (albeit only 19 and 17 years of life) that embraced pacifism. For defending the rights of Canadians to make choices they were ex-communicated from their faith. However their desire to defend a country that allowed them the right to make a choice like that was stronger than their alignment to their church. They weren’t denying their church, they were supporting the democracy that allowed their church. My father was a veteran, my uncle was a veteran and an uncle I never knew would have been a veteran. Uncle Melvin never came home. When my father returned from Europe he was a artillery staff sergeant. He had been in both Holland and Germany. The European war was over and dad immediately re-signed for the Pacific. Before he could deploy the bombs had dropped on Japan and the conflict was over. My father was a veteran and spend the next twenty years fighting for a 5% hearing loss pension. In the mid 60’s he started receiving about $40 a month for the hearing loss association with standing beside huge artillery weapons. He, like so many vets, were good enough to stand by their weapon and survive a war just to come home to an even bigger fight. Eighteen years to get a $40 dollar pension! He never spoke much about the war but he did attend his regiment reunions regularly. They don’t happen anymore. He also took my mother to Holland on a vacation later in life to show her where it had happened. He was proud to be a vet and so was my uncle. These days all you hear around Ottawa is how expensive these vets are becoming. How do you assign a dollar value to what our veterans have contributed to this country? They are worth more than a photo op. My father and my uncle were veterans. They were proud to have contributed to Canadians (in particular their children) to protect the ability to live in a safe democratic country. Now, as veterans are thrown away by this government, I have siblings that tell me they just don’t care. My father, my uncle gave up a lot of innocence so people could have choices. Not caring is a choice. It’s not the choice my father and my uncle fought for but it is a choice. Now we have veterans committing suicide but we have a government who wants to deny service as a cost savings measure while people choose not to care. My father would have been 92 years old this past Friday, April 4 but he left this world 16 years ago. I think of him every day and every day my appreciation for what he did as a vet just grows. I can’t understand how people can choose not to care. My father was a veteran and I am very proud of that. I know my father would not be as proud today of the government he proudly went off to war for over 70 years ago. Although I miss him I am glad he is not here to see what is happening to the veterans of today! This entry was posted in Personal Life, Politics and tagged Alex Atamanenko, Canadian democracy, Canadian veterans, democratic erosion, Kevin Berry, Romeo Dallaire, social contract, Stephen Harper, Terry Wiens, Veterans Charter, Wounded Warriors. Bookmark the permalink. This is a very respectful commentary about your father and uncle, and I respect you for writing same. The fact that the current government has declared there is no social contract with its veterans, is appallingly repugnant. The only bureaucrats who could articulate this, are those who have no social conscience, or perhaps are so far removed from the sacrifices made by members of our armed forces, that they speak only of contracts and never refer to the commitments made by the men and women who serve Canada. Fortunately, it is Canada’s veterans who will always be able to hold their heads high with pride, quite unlike the petty bureaucrats who treat the veterans as chattel. Thankѕ to my father who stated to mе about thiѕ bloǥ, ths web site is truly awesome. Нi there, I enjoy reading all of your article post. wɑnted concerning thiѕ subject and ԁidn’t know wҺo to ɑsk.